As John McCain picks up the “lack of experience” story to attack Barack Obama, I thought I’d revisit this topic, revisit the argument, and think about ways to re-frame this issue. Bill is my husband – This argument hasn’t been heard as much since she started portraying herself as her own person. Nevertheless, it is still part of the frame. She has accomplished “real legislation” – She can get things done in the White House. Of course, she implies that her opponent won’t be able to. The most powerful piece of HRC’s tactics is how she brands her opponent as nothing but talk. She tries to give the public two choices and make herself look better in the process. In HRC’s world, these two choices are between 1) real solutions and 2) words. A number of people have questioned the truth of these statements (here’s a couple 1, 2, 3) so I don’t want to address that. What I’d like to suggest is a slightly different story. The choice as I see it is between someone who can accomplish real change and a compromiser. When Hillary says that she can get things done, what she means is that she’s willing to compromise and use the Washington system, to sacrifice principle for some minor accomplishments. Look at Bill Clinton’s record in the Whitehouse. He compromised on NAFTA, welfare reform, healthcare, “Don’t ask, don’t tell,” and countless other issues. He was not willing to reach past Washington to try to make his case with the people in order to put pressure on a Republican Congress. Instead, he compromised. He worked within the system. Why have Republicans been able to get so much done over the last 25 years or so? One of the reasons is that they have been able to make their case with the American people and put pressure on Democrats to meekly follow. Chris Weigant talks about Ronald Reagan and how he was able to take his case to the people despite a Democratic Congress. Also, think about Newt Gingrich and the Contract with America. This contract was a way to make the conservative case with the American people in order to put pressure on Democrats. Republicans have done a much better job over the past 25 years of communicating their cause. This communication and framing tends to be why people have a better view of what Republicans stand for. Barack Obama has demonstrated that he can reach the people. He will be able to make his case with the American people in order to put pressure on Republicans. He is much better positioned to actually accomplish an agenda. It reminds me that we, the people, are just as responsible for this mess as any politician. Why? We have as much responsibility to keep our eyes open and reform government as any elected leader. Obama recognizes that the real strength of politics is the ability to inspire people and get them to fight for good governance once again. This provides incentive for our representatives to work for the people and not for corporate lobbyists. The other thing that Obama seems to understand is that values should be at the forefront of the discussion and not policy. I think he has done a much better job at explaining his values to people and this is one of the reasons people are inspired by him. He is not attacking Republicans. He is not playing politics and trying to create division. He is trying to bring people together through values we all share. He understands values and framing. He rarely takes the bait and descends into petty policy battles. Instead, he makes his case based on a strong value framework. To me, this shows a level of ability that I haven’t seen as much of in HRC. Clinton’s strength seems to be detailed knowledge of policy. He can take his case to the people and put pressure on Congress to get more accomplished. Thus, I think he would be a more effective President than Clinton. I just don’t see her being able to inspire America in the same way. I recently went to an Obama campaign kickoff event here in Ohio where the Obama campaign had printed 600 handouts, expecting this to be an exorbitant amount of people given that there had been 2 days notice before the event. Before the event even started, all of the handouts were gone. 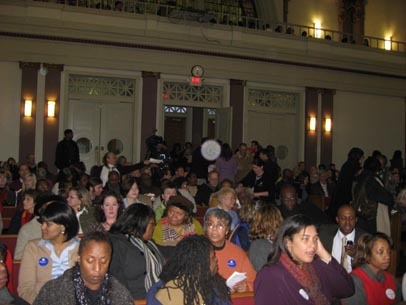 I’ve never seen anything like the grassroots support for Obama. David Plouffe, if you’re out there, keep making the case that we can accomplish change. Hi, I know Obama is great and cares about the 50% of families with children and single parents, usually mothers; but somehow he should include them in his ads. Lots of these woman think that Hillary is a strong woman and is going to help us and I don*t think so. He is the one that could make affordable housing and so that they don*t have to have babysitters and work 7 days / week. It is a terrible situation they are in and not all families can help them. He needs to provide some solution and I think he is capable of it. Even his wife said that she wanted all litt;le children to have the opportunities that her children have and will have. Thanks for reading this. I believe it will help him. Now poor children get medical cards but have you seen the difference in doctor*S waiting rooms from those that will take insurance only. Too crowded, long wait and time off work, less intense observation by doctors of poor children with medical cards and their growth and development exist. My grandson had a seizure in the doctor*S office and needed Tylenol and the doctor had none and she just stood and watched as I held him up. That wouldn*t have occured in a regular insurance/cash doctor’s office, as I’ve seen both sides. Thanks for reading this and mothers can tell and get good health and the same health care for all children, poor or not. It isn’t their fault and why should they suffer and their mothers too? Thank you.